In keeping with Sheridan’s Strategic Plan and Mission Zero Program, establishing aggressive targets for energy conservation and waste reduction across its campuses, HMC2 opened as one of the most energy efficient academic buildings in Canada. Its design strategy established HMC2 as an exemplar of leading edge sustainability in Mississauga and for academic institutions more broadly. The building is designed to LEED NC 2009 Silver; certification is pending. HMC2 employs an economy of means to develop a holistic, meaningful and forward-thinking response to context, program and sustainability at a large scale on a restricted budget. Efficient planning resulted in a compact building footprint and strong 1.57 net to gross ratio, maximizing site potential and program area with minimal material consumption. A doing-more-with-less attitude permeates the building; highly adaptable platforms, partitioning and multi-purpose spaces provides both specificity and flexibility. Simple, durable, off-the-shelf cladding material – brick, metal and glass – was employed methodically to create a dynamic building expression building while maintaining an efficient enclosure. Vertical strips of standing seam metal and curtain wall interchange methodically, playing with light, shadow and the level of transparency of the facade. Expansive glazing on the double-height base reveals the activity of the Creativity Commons, draws natural daylight deep into the building and offers the building an engaging street presence. Above, windows are used moderately as part of a highly efficient envelope design, gradually increasing to reveal more open, collaborative spaces and decreasing to defuse sunlight in instructional spaces particularly along the south and west frontages. The distinctive patterning of the elevation and the usage of selective areas for large expanses of glazing give the building an open and transparent feel, while maintaining an optimal 30% window-to-wall ratio. Passive design strategies coupled with efficiencies in construction assemblies and systems design yield an aggressive waste reduction target of 345MJ/m2/annum (96kWh/m2/annum) and provide a 42% energy cost savings. Meeting these aggressive energy target required an integrated and holistic approach to design, from envelope performance, to highly efficient building systems. The design features a compact and efficient floor plate, and moderate use of glazing and spandrel panels. The usage of selective areas for large expanses of glazing gives an optimal window-to-wall ratio of 30% and decreases annual heating and cooling energy usage. At 10% of gross wall area, the design for HMC2 also has a moderate use of spandrel area. The design for HMC2 uses chilled beams throughout the building as the primary source of cooling; with their high induction ratios, these active chilled beams are able to generate high cooling capacities with low primary airflow rates. Finally, a large percentage of energy usage in a building can be attributed to the performance of the mechanical equipment, which provides heating, cooling, and ventilation. Reductions in energy usage were obtained using heat recover chillers, Condensing Boilers, Variable Speed Drives, and a winter cooling coil. HMC2 provides occupants with ample daylight and fresh air without compromising energy performance. Natural daylight infuses program and circulation areas to create bright, welcoming spaces. To enhance the comfort and productivity of students and staff, the building provides adjustable, individual lighting controls in all classrooms and shared multi-occupant spaces, as well as independent student and staff workspaces. The building uses LED lighting to achieve lighting power densities of 0.5W/ft2, significantly reducing energy use. The project annula energy consumption of the lighting system is 18.2 kWh/m2. To promote a healthy indoor air environment for students, faculty, staff and visitors, and maintain a high level of thermal comfort, the ventilation, envelope and HVAC systems are designed to meet the ASHRAE 62.1-2010 standard and ASHRAE 55-2004 standard respectively. An Operations systems manual was developed to ensure conditions would be maintained within acceptable comfort limits. Local discomfort effects – radiant temperature asymmetry, vertical air temperature difference, floor surface temperature, and air drafts – were all considered in the design. The average provision of fresh air is 3 air changes per hour. Multi-occupant spaces include sensors and demand control ventilation. Demand Control Ventilation reduces heating and cooling energy, as well as associated fan, pump and heat rejection energy requirements. Fresh air requirements are determined by CO2 sensors located in spaces with intermittently high occupancy, monitoring outdoor airflow providing adequate ventilation during high occupancy times and allowing less fresh air to be supplied during low-or un-occupied periods. To reduce ozone depletion, all HVAC equipment is also CFC-free, and fire suppression systems do not contain halons. Air handling units were turned off during construction as one of many strategies in an IAQ management plan implemented to improve indoor air quality. To further minimize the quantity of harmful indoor air contaminants, major building components, including adhesives, sealants, paints and coatings, contain only low amounts of Volatile Organic Compounds. Air quality was tested for contaminants prior to occupancy. New pedestrian sidewalks and bike paths connect the north façade to the City Centre Transit Terminal, the cycling path on Rathburn Road, and Highway 403. Forty (40) bicycle racks and changing rooms with shower facilities are provided to further support cycling as an alternative means of transport for daily commuters. 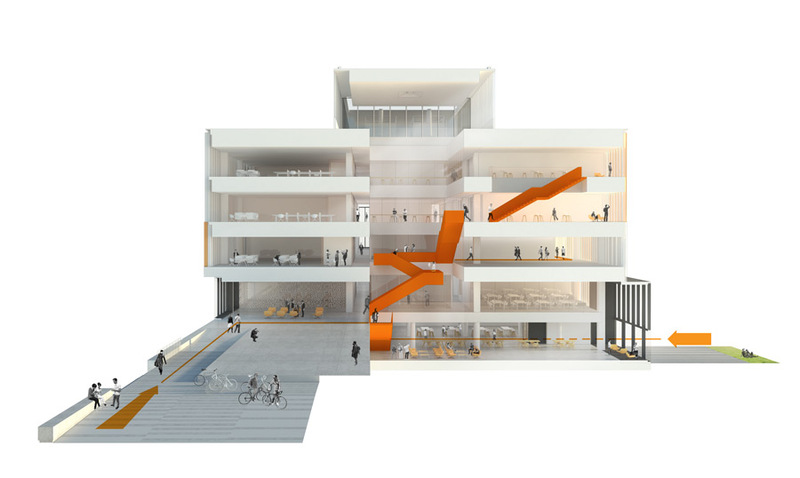 Within the building, the preferred means of vertical transportation is a feature scissor stair escalating 5 storeys through the vibrant atrium space, encouraging active circulation. Generous stairs at the north and south are also integral to the corridor system and a preferred mode of moving between floors. These innovations in design have been achieved without introducing operations and maintenance requirements for Sheridan. To reduce the site development impact, a LEED-compliant Erosion and Sedimentation Control (ESC) Plan was implemented and monitored throughout construction. The design also integrates other storm water management strategies to reduce runoff from the site; strategies are consistent with the Mississauga Low Impact Development Guidelines. A storm cistern on site has been coordinated with the mechanical systems and will allow for the future incorporation and implementation of a rain water recovery system. To complement the development of academic facilities on Sheridan’s new campus, a dramatic new public park, Scholars’ Green, is being introduced to the site. HMC2 benefits from a 49% reduction in water consumption relative to the LEED baseline. The anticipated water consumption is 1302 L/person/year. Low flow water fixtures are used throughout the building, which provide improved water efficiency. All landscaping and plant species selected for the site are drought-tolerant plant species, including several native Ontario species. No potable water is required to maintain the landscape; eliminating the need for an irrigation system. The building is designed to minimize material use and construction waste over the building’s lifespan resulting from inappropriate material selection or premature failure of the building and its constituent components and assemblies. Materials were selected in order to: enhance the building image; contribute to sustainability goals; address accessibility; and contribute to durability. Simple, durable, off-the-shelf cladding material – brick, metal and glass – was employed methodically to create a dynamic building expression building. A High-albedo roofing covers the entire roof, reducing the heat island effect. Construction assemblies with increased thermal resistance values decrease thermal conduction between interior and exterior, thereby reducing the amount of heating/cooling required to offset this loss. Cold spots caused by thermal bridging were identified through computer modelling and eliminated to maintain the continuity of the thermal layer across exterior assemblies. Nearly 50% of the materials were locally extracted and manufactured. Over 28% of materials selected contain at least 20% pre- or post-consumer recycled content, including steel and drywall. A construction waste management plan diverted 92% of construction waste from the landfill. A Building Durability Plan (BDP) was developed and implemented in accordance with the principles of CSA document S478 – Guidelines on Durability in Buildings and a Durable Building Envelope and Structure was achieved through LEED® Canada-NC 2009 RPc1 (RPc1). Window to wall and clear to spandrel ratios have been considered to ensure continued good performance over the lifespan of the curtain wall system. Solid areas of the envelope have been maintained as a rain screens/cavity wall construction. Selected for ease of maintenance, exterior materials require minimal upkeep. A 50 year service life has been selected for the overall building – a “long life” category as described in CSA-S478. Beyond material considerations, HMC2 anticipates and accommodates the potential recycling and repurposing of infrastructure to suit evolving learning platforms. 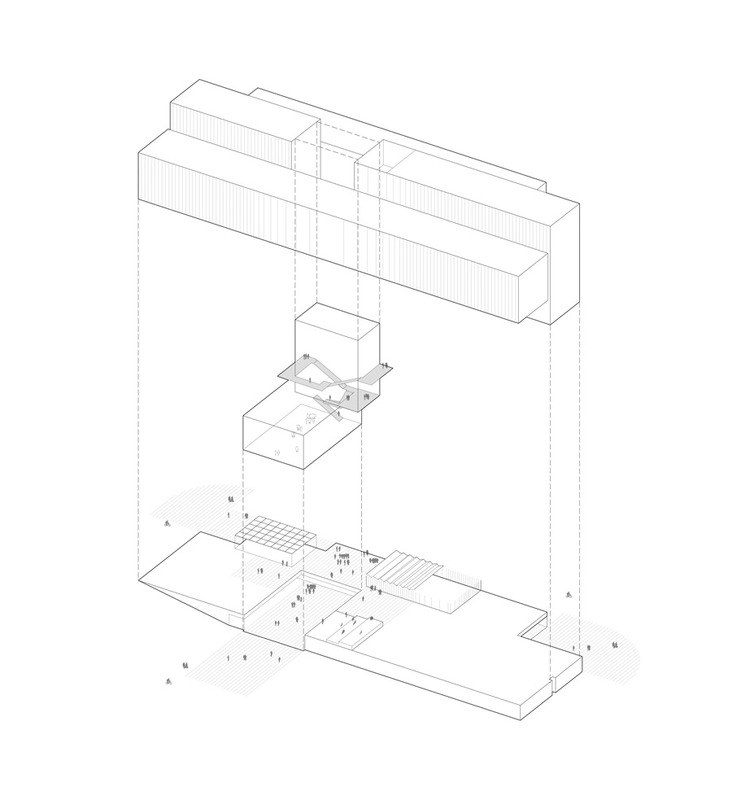 A three-bar organization concentrates fixed elements – corridors, elevators and stairs – in the centre, leaving the outer bars, designed with modular structural grids, reconfigurable along their lengths. Partitions can be relocated without compromising access to windows. Looping mechanical and electrical lines coupled with raised access floors and ceiling plenums prevents the relocation of costly systems. Physical flexibility is complemented by a highly integrated and scalable IT infrastructure. Many of these systems have reduced service needs; those that may require periodic replacement have been made easily accessible. The networking of BAS, DMS, LCS, Security System and Fire Alarm systems provides real time data on the operation of the building and allow issues to be diagnosed before they escalate. The design also supports future development on the site and potential building modification or expansion through program distribution, links and service delivery, including a minimum of 10% additional systems capacity. Promoting problem-based teaching, research and applied work, Sheridan has enshrined their sustainability principles in both its academic programming and operational decisions, creating in HMC2 a holistic model for sustainability education. Home to the Sustainable Built Environment Department, HMC2 is a Living Laboratory, showcasing and interpreting sustainable features and technologies in its design, structure and systems. Beyond supporting the pedagogical objectives of the program, this initiative promotes a positive campus-wide energy culture and imbues Global Citizenship as part of Sheridan’s larger sustainability mandate. Live performance infomatics, interpretive signage, mock-up displays, and exposed building systems are readily accessible to students, staff and visitors, encouraging a daily awareness of how buildings function and consume energy. This demonstrates the positive impacts of the sustainable design strategies, and inspiring a commitment to design, implement, adapt and teach new approaches that address issues of equity, economy and ecology. Just as the building and its systems will change over time, so too will the data and signage. Signage can be added and digital data is open and web enabled so that students can continue to profit from building as a teaching tool for generations to come.